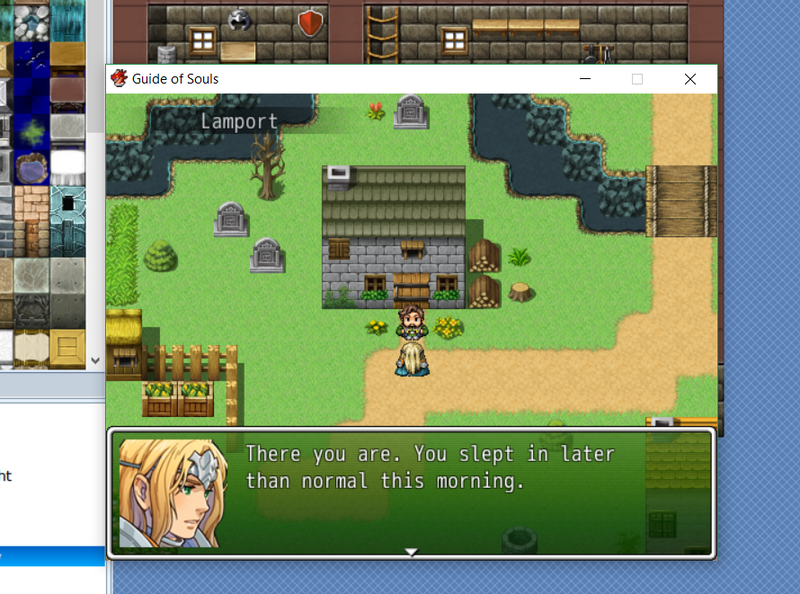 Guide of Souls is (going to be) a top-down RPG about an old warrior, born with the ability to see ghosts. You play this old warrior, who helps ghosts pass on into the afterlife by hunting down and killing their murderers. His abilities are well-known, both in his community, where he works as the guardian of a small township, and among the ghosts, who travel from far and wide to ask him to avenge their deaths. I'm using RPGMaker VX Ace (the version of RPGMaker that I currently have) to create this game, with the idea that I might finally buy a pro version of RPGMaker once I get this game off the ground. 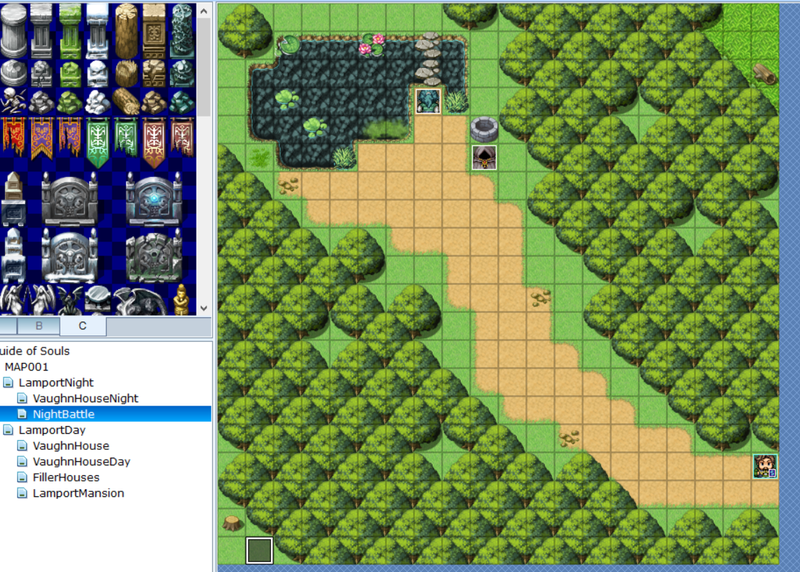 This will be my first time using RPGMaker, or indeed a visual game design program at all. My primary goal this jam is to gain proficiency in RPGMaker. I would love to come out of this with a completely working game, but my idea might turn out to be a bit too large for the free version of this program. If I can't create the full game that I want in this version, then I want to at least come out of this jam with a playable preview of what my full idea is. I also want to learn how to create my own visual assets. I started the jam knowing what platform I wanted to create my game with, and a basicbasicbasic idea of what my game narrative would be. I spent the day brainstorming story ideas, conceptualizing my plot outline, coming up with a title, and creating my player character's background story (as well as trying to come up with his name). 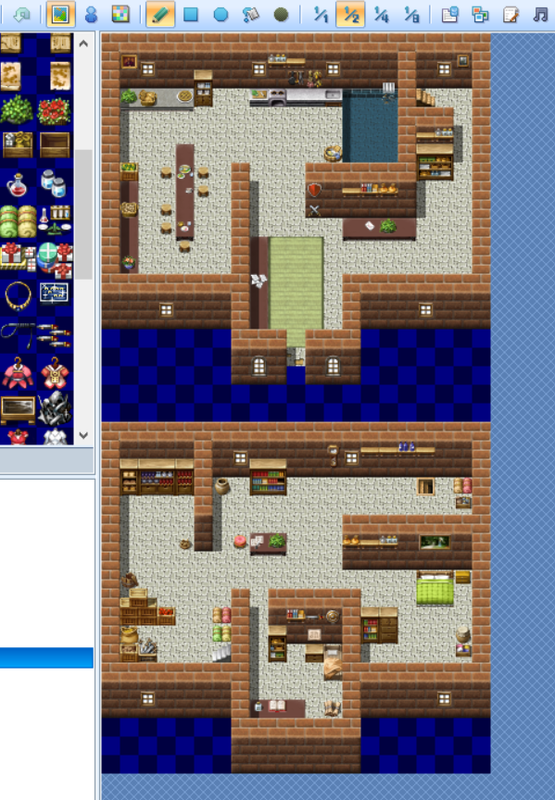 I then went through several pages of the official RPGMaker VX Ace tutorial, and created the 'home' town map. I spent multiple hours designing that map, so I'm thinking maybe I shouldn't spend that much time on mapmaking in the future? There's probably a bit too much 'stuff' on the map (I just wanted it to feel real, y'know?) and I need to make a map for literally every possible indoor area now, plus the field map and literally every future location map, and if I spend two hours for every 30x30 square tiles......... that's gonna be more hours then I have. 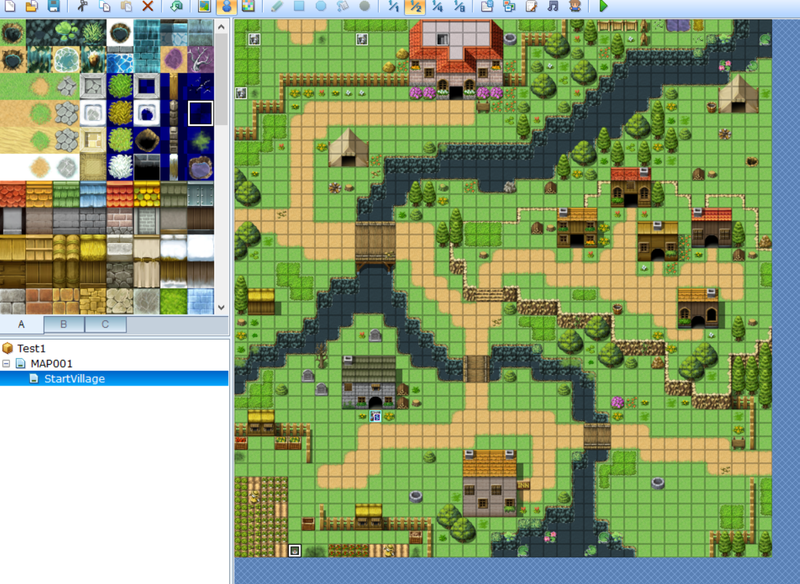 Also I don't think I need to make them all 30x30 square tiles. I'm going to use pre-made assets until the game's pretty much done, and work on creating my own assets afterwards, or at least that's my current plan. My plan for tomorrow is to build every character profile (on paper and within the program), and come up with a serious project plan so I don't waste as much time on minor details. Nice town design! Don't forget that games like Pokemon -- which often have houses that are identical inside -- can still be really well-made, so there's no harm in simplifying things for yourself. Not much visually to show for today, mostly a lot of concept work. I've created my four party members, with names and customized classes and skillsets all included, and I conceptualized the five main areas of the game (a main location for each party member, plus the main boss). I wanted each character to have a vastly different background, so I spent... perhaps too much time coming up with realistic names based on their differing real-world inspirational regions. 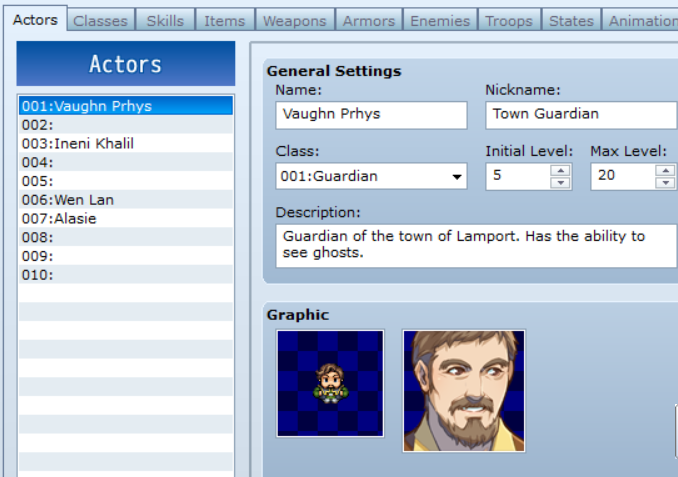 Creating character classes and skillsets proved to be much more fun than I expected. Because I have such a limited cast (enemies included) each character gets to have a class with stats and skills tailored to them. There's still some skills I need to add in, and I need to work on enemies... but I feel like I might put that off until I actually get to my first enemy encounter. I'm still using the pre-made visual assets that come with the free version of the software - I looked around online a bit for some free assets people were sharing, and I was... not very enthused. I'll hold off on worrying about character sprites until next week. I'm thinking of just pulling the pre-made assets into photoshop or GIMP and editing them. Of the five play areas I have planned, my goal is to have at least the first one fully playable by the end of the jam. Obviously I'd like to have all five fully playable, but if it looks to be taking too much time, I'll settle for just the one. That's not true, I just had kind of an off-day in general, and accomplished much less than I wanted to. 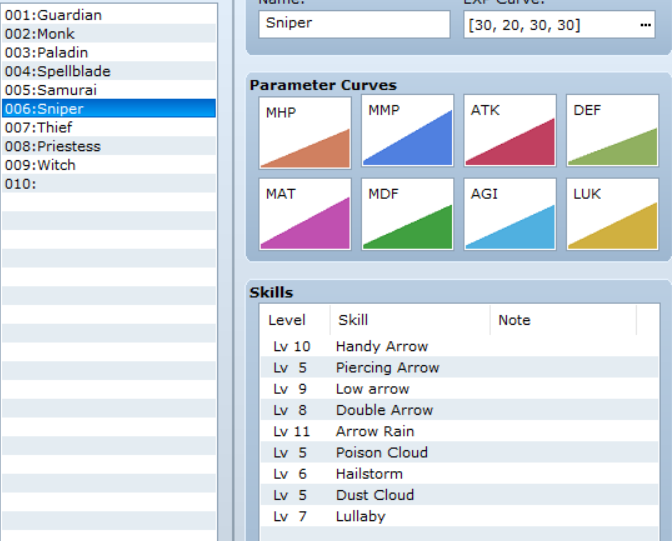 I finished creating all the custom skills for my PCs, and assigning them to the character classes for each character. I'm keeping the levels the classes learn each skill low for now, until I figure out about how much leveling each character will actually do during the course of the game. I also messed with the maps a bit more today. I had an idea for the very first playable scene in the game, which would take place at night, but there's no 'night' feature within this program. There's free script edits I've found online, but I believe the free version of VX Ace doesn't allow me to edit the script, so I decided to test out the cheapest workaround possible, and just throw the program's 'shadow' feature over the entire map. It looks... definitely not ideal. But also not horrible? I'll keep this for now and see what I can do about a better 'night' mode later, when I have more time to work on visual assets. I also spent about ten minutes (I'm getting better!) 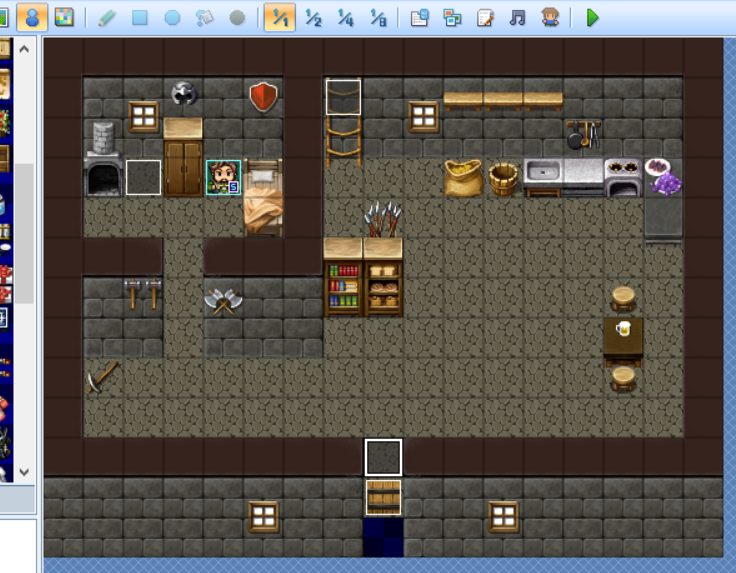 throwing together my protagonist's house interior, which will show up approximately twice in the game. 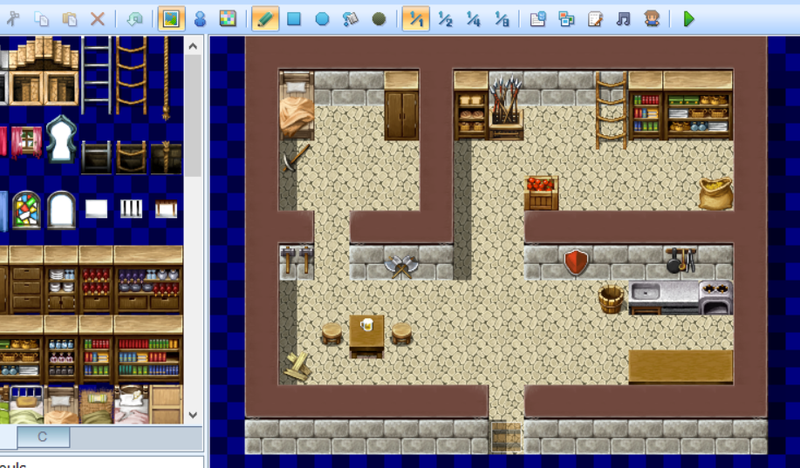 Tomorrow I've got to work on the other interior maps (the other houses in the town that you can explore), as well as creating the first battle of the game, if I can get that far. Wish me luck! i'm really into this game's premise--i feel like there's a lot of potential to have some really emotionally connecting moments for a player. not sure how much of a story you have so far but it would be interesting if there was some element of choice in this narrative, especially as an RPG. i also agree the village and interior map look really great so far! 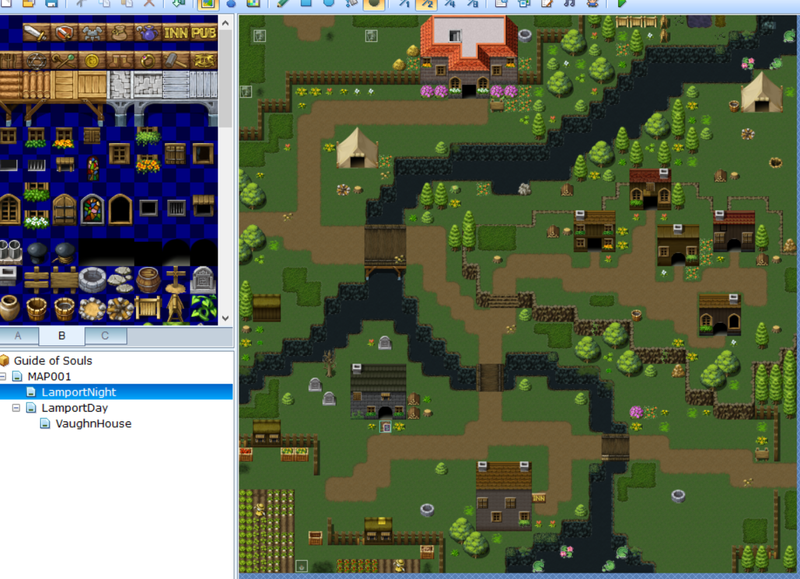 for the night part of the village--if you're able to import + export tilesets what i would do is export the tileset, add a dark blue overlay in photoshop, and import it separately. That's a great idea, thank you for suggesting it! That saves me having to create my own original assets, which is what I was considering in order to add 'night' versions, and which I'm starting to believe I won't have time for during the jam. Also thanks for the compliment! Emotional resonance is definitely something I find important in my favorite games, and which I want to include as well. Definitely a more productive day than yesterday, even including the time my computer restarted without my permission and I lost some unsaved work (only about 30 minutes worth, thankfully). I didn't get as far as the first battle scene, but I started coding in (if I can call this coding, which it's really not) the first 'cutscene', or the pop-up text that appears as the player starts the game and introduces the first guided quest. Not a whole lot going on in this specific text event, but there's a series of events that the player triggers as they explore. This is to encourage the player to explore the early map (I don't plan to spend too much plot time here, and I did spend so much time on it...), as well as give the player a sense of control over the 'scene'. Beyond coding in a number of these events, I also created a few more early maps. 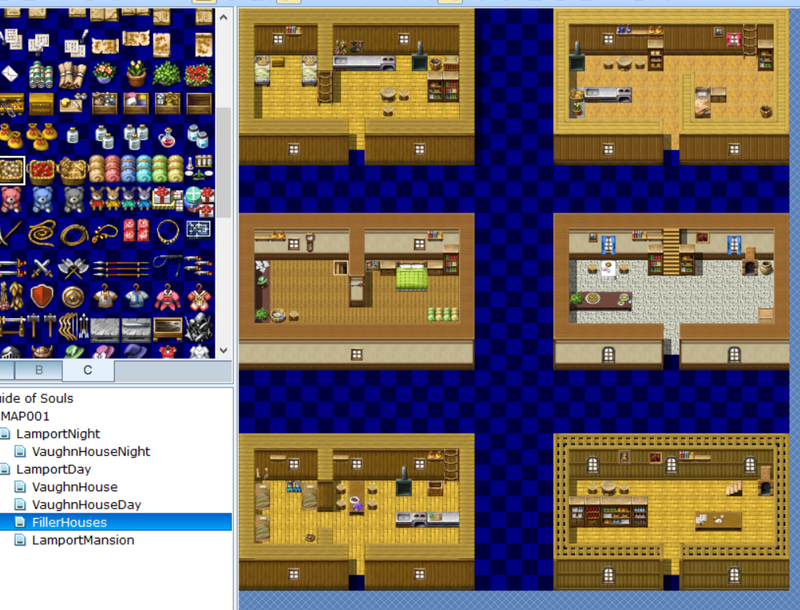 I redid the protagonist's house to improve the layout (pictured below is the 'night' version with the whole map shaded in, and the opening 'cutscene' events included), created some filler house interiors for the town, and created the town mayor's house interior. As you can see from the pictures, I'm testing out including multiple navigable spaces within a single map page, mostly so I don't have 15 different map pages for one small location. I still have to code in the events to link all these locations together, so I can test what that looks like for the player. Tomorrow I need to finish this opening 'cutscene' and finally, actually, get to the first battle sequence. I think that'll involve making one more map, and then I need to focus on creating the overworld map and setting up generic battle encounters (I, personally, hate random encounters, but I need the player to be able to fight enemies to level up, so I'm including specific battle locations and events that the player will be able to trigger at will. Or, at least, that's my goal). I solved a couple random coding problems and scripted up to the first battle sequence today, so all and all a productive day! Or more like a productive night, I did half my work in just the last two hours and now I desperately need to go to bed. Updates are as follows. 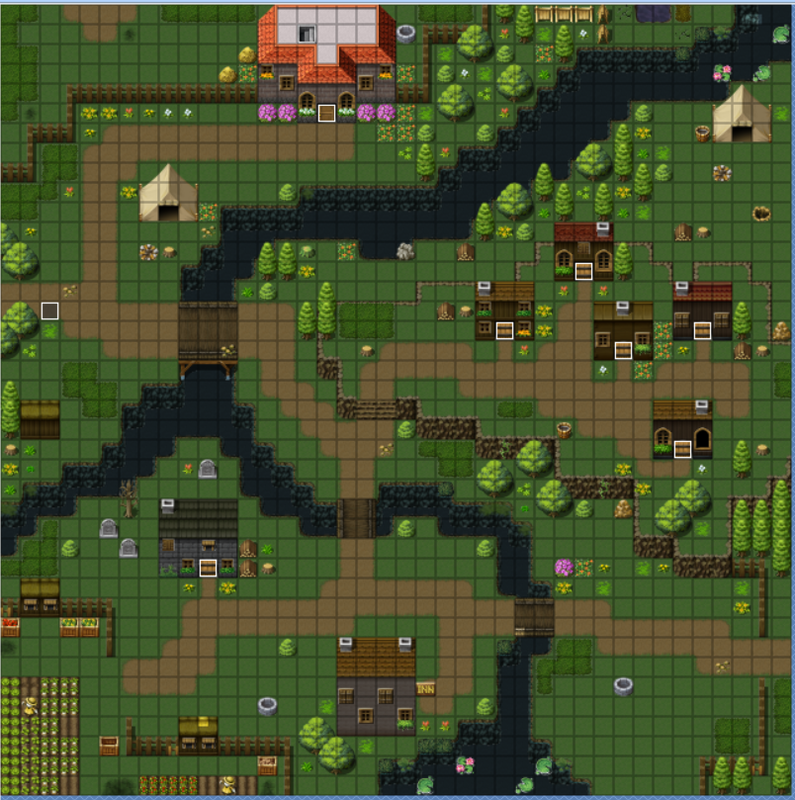 I added a bunch of events to the night version of my town map. The free version of RPGMaker only lets you include ten events per map, which I figured would be fine but now I totally see why someone would want more. The major problem here was the fact that my two town 'exit' paths (the bottom right, which will at some point lead to the overworld map, and the middle left, which leads to the next part of my 'cutscene', are both two tiles wide. That meant that to use a single event per tile to block of an exit/transfer a player, I would need four different events. I have seven doors that need transfer events too (remember how I went a bit house-crazy on day 1?) so obviously that wasn't gonna work for me. It took some time to figure out, but I finally realized I could use RPGMaker's region IDs to code the tiles in front of each exit. Then, within a single constantly-running background event, I have the program check to see if the player is on a tile marked with a specific region code. If they are, they're either blocked from going forward, or sent to the next map of the cutscene. Now I still have room for 2 more events on this page (and I started to get more ideas of how I might combine effects within a single event). I, of course, had to create the next map for the cutscene as well. This is where the first battle takes place in the game, and I had to figure out how to make the different events work together to create the scene. It's a bit less imaginative as far as my maps go, but I really need to pick up the pace if I want to have more than this one scene scripted by the end of the jam. Currently all the 'action' of this scene is scripted into a single event, set to autorun, moving the player and the NPC event into place as needed. 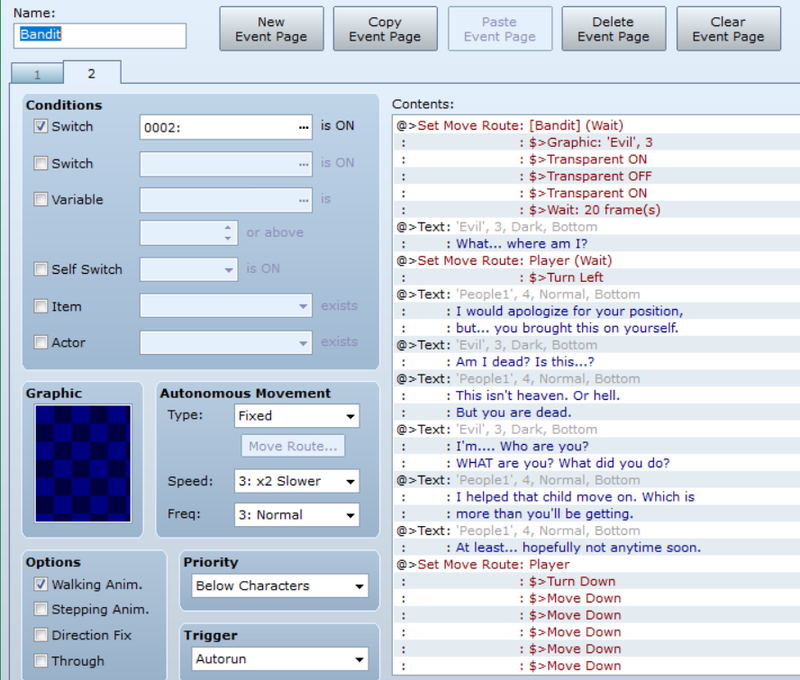 It's a very long event script, I feel, but part of that is just how much space the movement commands take up. After this point the player enters their first battle. Once the battle is won, the cutscene finishes, revealing to the player the full extent of their character's powers and what their goal for the rest of the game will be. My goal for tomorrow is to finish this scene completely - I still have a few extra events to script in, then the dialogue for the final scene. I really want to get to the 'next morning' bit, where I introduce the first companion character and finally give the player free control. Today I accomplished all the goals I set yesterday, wrote some bad dialogue, and crafted some badly-coded events! Here's some of the bad dialogue. You don't really realize how bad the stuff you're writing is until you see it in a different setting, so putting dialogue into code and then playtesting that scene is a really good way of seeing how bad your first drafts are. I managed to fit all the action of the 'cutscene' in just three events, which was pretty nice - there's a short conversation, then a battle sequence, then some sprites change or disappear and there's more conversation, it's cool. I almost forgot that I also took a screenshot of the Ghost event so here's this (look: more bad dialogue!) This event gets triggered by the player, hopefully right after the battle (I'm leaving it up to the player, so I just realized that when I get time I should throw in some random easter egg events on this map). 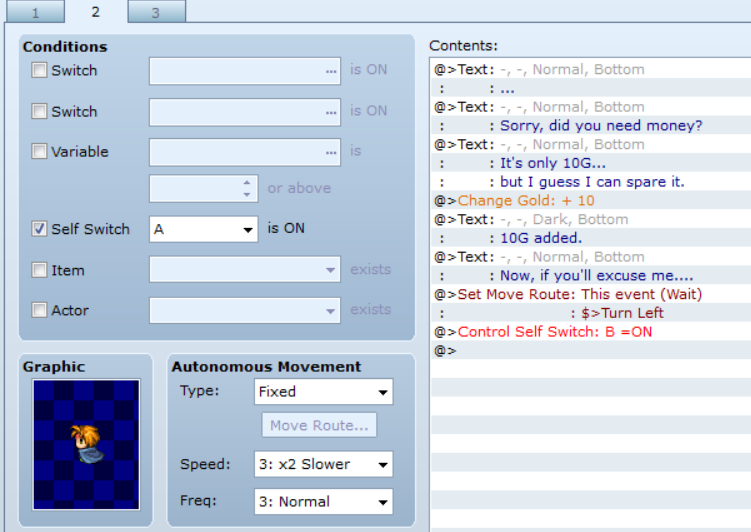 The switch then activates the previous screenshot'd event (I really should have uploaded these in the other order) and really, the takeaway here is that I'm pretty proud of myself at being a halfway decent GUI-directed coding. And here's the last part of my goal for today: introducing another character!! This is Ineni, Vaughn's apprentice of sorts. She... really should have a darker skinned sprite, and while I'm thinking I won't get around to creating my own visual assets by the end of this jam, I'll definitely continue working on this game after the jam is over, and original character sprites is gonna be high on my priority list. 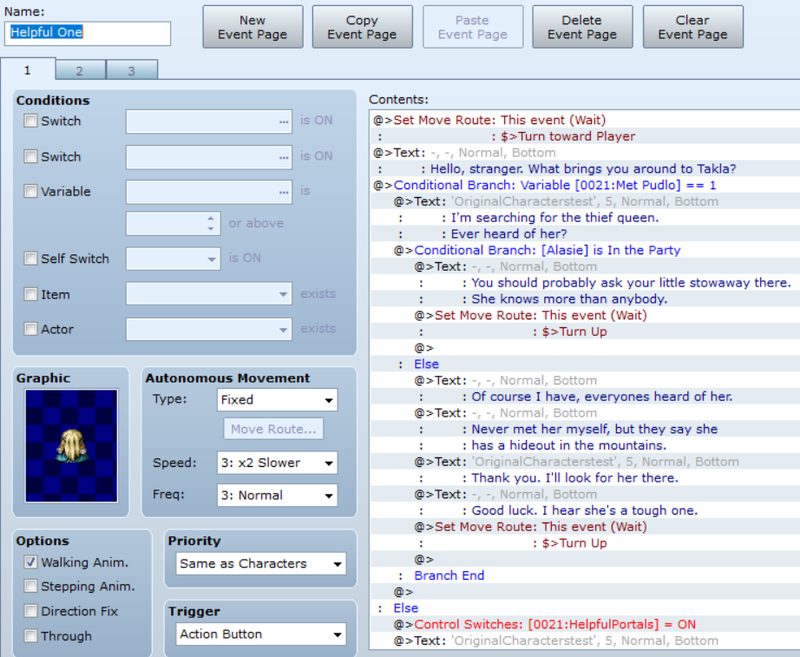 Anyway, she joins the party at the end of this short conversation, and the player is finally given complete control. Freedom! OK, anyway. 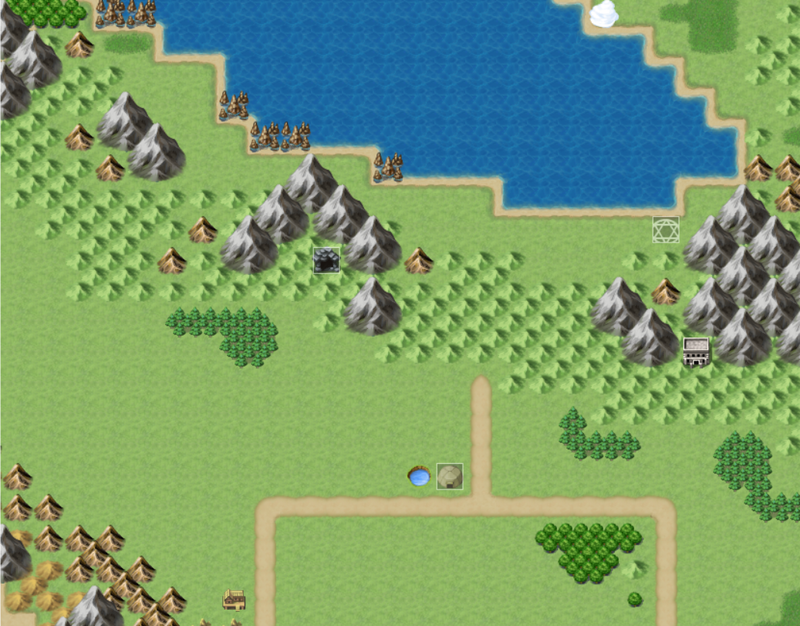 Now, my goal for tomorrow is to create the overworld map, and start populating it with enemies. I was originally thinking there would be no random monster encounters in this game, but I'm rethinking that. Human-based battles will definitely be more important (this game is about GHOSTS so), but there's also a lot of magic, so of course there will be magic-based creatures. I'd also like to create the event that encourages the character to explore the world map, and some more ghost NPCs. This is a ghost game! great work on debugging and knocking out your cutscenes! honestly RPGMaker + vn + text games can be kind of tough for this jam because they're mostly content heavy. while you might not spend a lot of time hammering out mechanics you'll definitely feel the grind in creating assets, maps, dialogue, etc. i'm also not a huge fan of random encounters either--i'd be curious if you had a different solution or decided to go with it because it's easiest/most familiar. either way, awesome progress! Thank you! I've decided to drastically scale back my goals for this jam, I overestimated how much work I'd get done each day - and what a difference having the full version of RPGMaker would make. I'm planning to finish a demo or beta version for the jam, then (when RPGMaker goes on sale again, and I can afford it,) develop the game into something closer to my original vision. And yeah, random battles... can get really tedious really easily. I'm going to include them for the jam, but when I expand the game later, there's going to be a limited (but large) number of individually-designed encounters. The idea was that for most of the ghosts the player runs across in the world, there will be a murderer somewhere as well, and the protagonist's goal is the avenge the deaths of each ghost he meets. The battle encounters wouldn't spawn until the player had talked to the appropriate ghost (that way you're not just slaughtering people willy nilly), and afterwards the ghost would have disappeared (having achieved peace). That way, there'd be a ton of potential battles to level up with, but the player would have to seek them out individually. It sounds, just thinking about it, very tedious for me to build, but way better for me-the-theoretical-player to play. In theory. 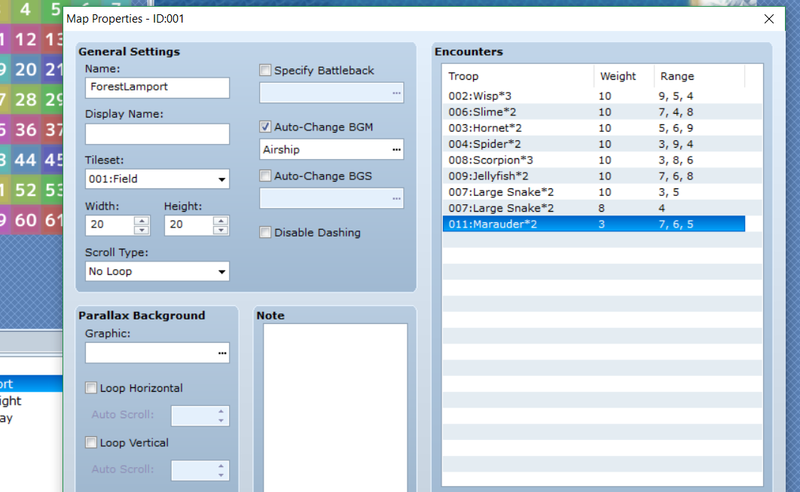 Again, for the jam I will use random monster encounters, but I'm gonna see if there's a way I can do them with diminishing encounter rates. So the thing is, I do a few hours work first thing in the morning, do literally everything else with my day, then another hour or so in the evening before I post the devlog update, so by the time I'm here in this textbox I don't actually remember much of what I've done. Or at least, that's how I feel today. 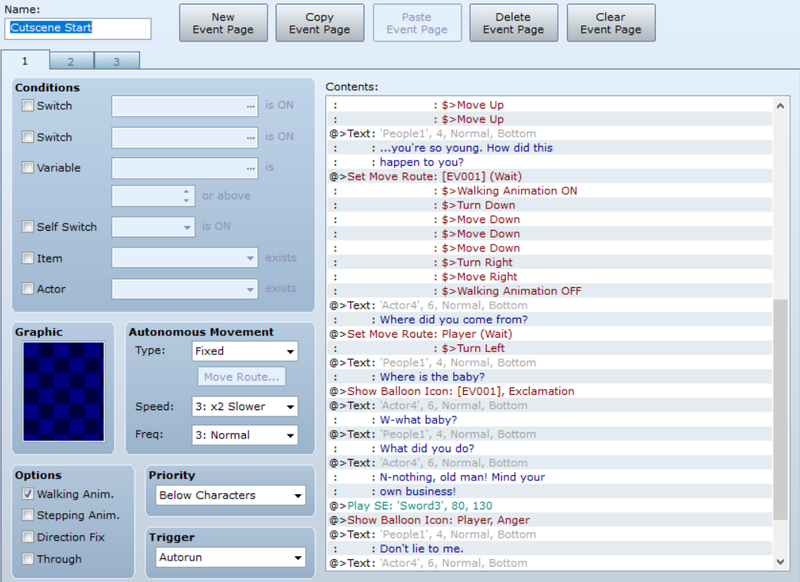 I did some minor edits to the dialogue and event commands I'd previously coded in. 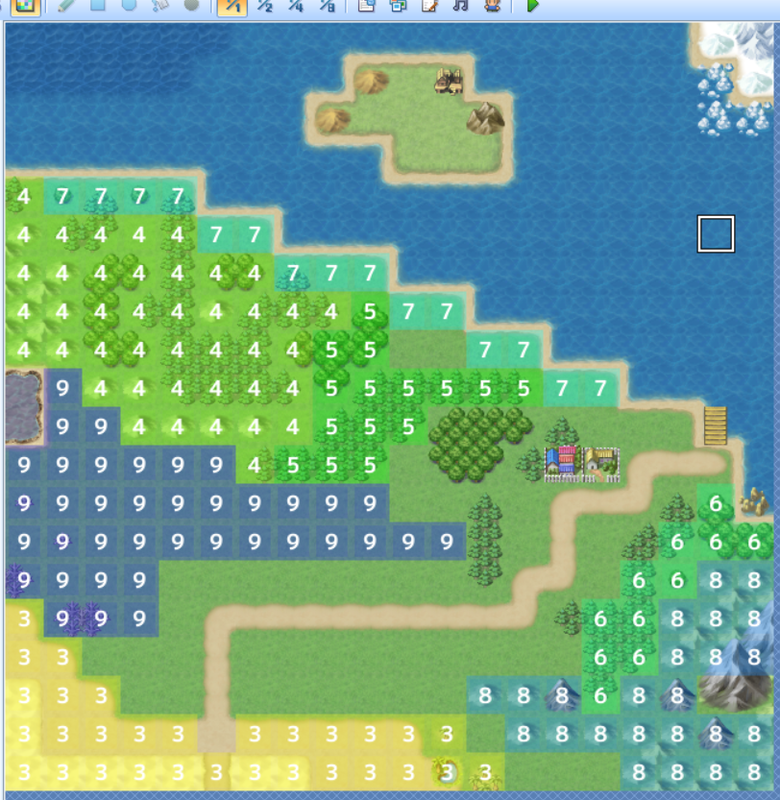 I added in transfer events so the player can travel between the town, the main overworld map, and the second overworld area. I also distinctly remember copying the little town grove map that I made for that opening cutscene (see: Devlog Day 5(?)) and making it so the player can travel back to the area during the day, and talk to the ghost of the murderer they, uh, killed. Battle encounters! I spent no longer than half an hour on this because I really don't want this to be a big deal in the game. I recreated the overworld map for this area (I had a previous map made up, but as I've developed the story further I've realized more about where events need to be taking place) and divided it into regions for random encounter battles. I spent no more than a half hour on this because I already know I'm going to be overhauling this entire system when I expand this game after the jam. I also started working on the map for my second area, which is basically a giant snowfield. I put a bit more thought into creating the main town of the area, so I wouldn't have to use up so many of my limited events on doors. The player will be meeting their second (third?) party member here, who I'm excited to introduce tomorrow. We're about a week into the jam, so I'm reevaluating my project goals. Unless I take next week off from everything else in my life, I'm definitely not going to meet my original vision for this game. Which I'm not upset about because I knew I was setting a lofty goal, and if I keep up the pace I've been working with (and, fingers crossed, improve) I'll actually be about halfway to my original vision, which is not bad. And, I'll have a completely playable (if short) game, which is way more than I had before this jam started?? I have four main characters I want to be in the game before the jam is over. I won't be able to program in my original ending idea, but I want to include a suggestion of what the original end goal was. In that vein, I want a temporary win condition programmed instead, so that the game still feels complete for potential players. I want the four main areas of the game to have maps drafted, even if they're not fully populated with events or enemies yet. And I want to have my own custom sprites because the more I think about that, the more it bugs me. Tomorrow I'm going to figure out exactly what the temporary win condition is, and how to implement it. 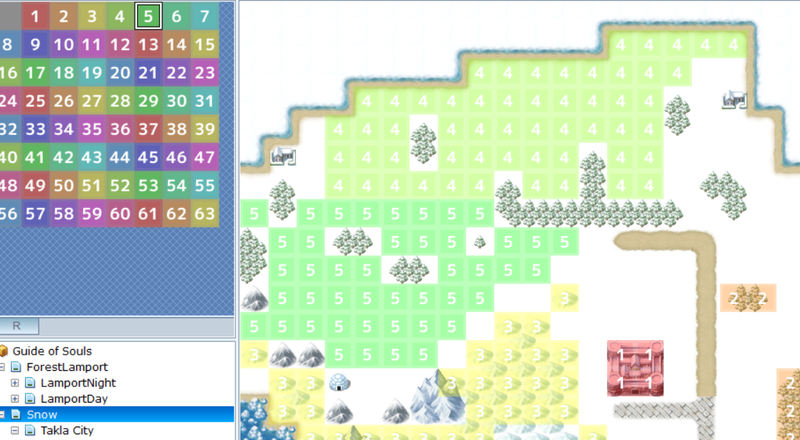 I should also draft the rest of the overworld maps, because those should be relatively quick to do, and start adding events to the snow town map to introduce this next character. 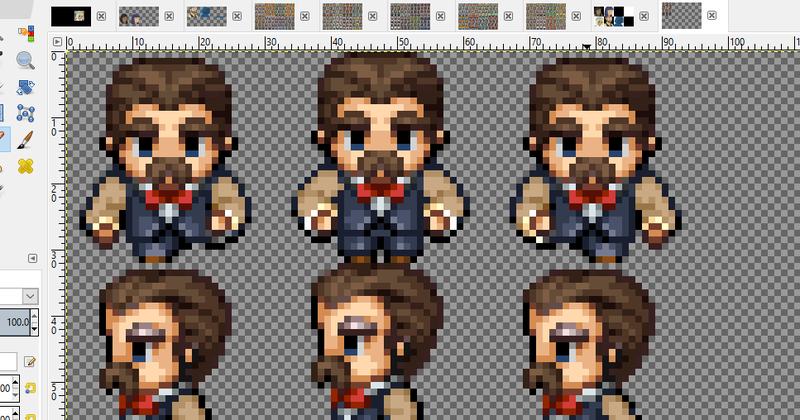 This weekend, though, I think I'll focus entirely on creating original character sprites. Those two days are relatively free for me, and I'll get to see how long it takes me to do, and I won't have as many old event pages to update to the new images. No pictures today, it was a really lax day for game development over here. And a busy day for many other things. I made a couple more maps and events, nothing that required a lot of work. I guess I also decided on my win condition for this version of the game, which was a really important thing. This weekend's plans still stand; gonna focus on visual assets for the next couple days. Hopefully I'll have pictures of those tomorrow! Drew stuff today! I actually drew more today than I have in..... quite a long time. So, while I'm not an amazing artist, I'm pretty impressed my character design attempts didn't come out awful (I'm going to admit, I did trace the built-in face artwork to get myself started on face shapes, but I think I was able to build off original designs from those tracings). Obviously these are still just sketches, but I got designs picked out for my four main characters so all I'll need to do tomorrow is... color them and touch them up and crop them to the right size and then also make sprites for all of them? I believe in myself. I also want to get all of this done before I do too much more with the code, specifically so I don't have to put the placeholder images anymore, and then remember to change them up. I think I'll focus on art, and coding in minor events/battle stuff, for the next few days, and tie it all up by Wednesday... but I'm getting ahead of myself. 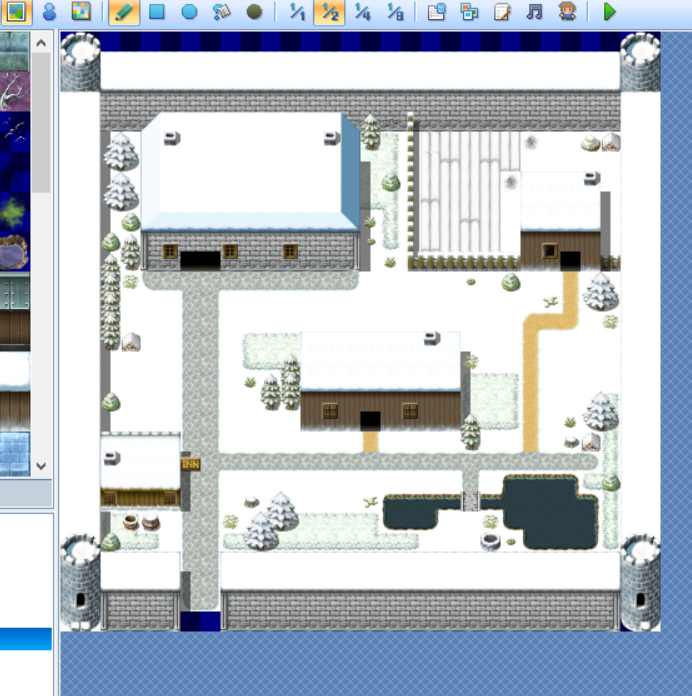 I also took J's advice and pulled a dark blue overlay over my exterior map tiles, to simulate a night scene. I really like how this looks, but I think re-importing the darkened tiles, and re-making the entire map, and checking to make sure tile passability is all the same and everything, will take a bit more time than I know I have. I have the darkened tiles saved, so I can import them in at least, and if I find myself with an extra hour before the jam is over I'll do that. Couple more maps made, and I've got the main overworld maps divided into regions to start implementing random battles again when I get a chance. I keep thinking the jam is ALMOST OVER but really we've got.... just a little under a week? That's enough time to still do a lot of work. Hey! Been enjoying reading your devlog. 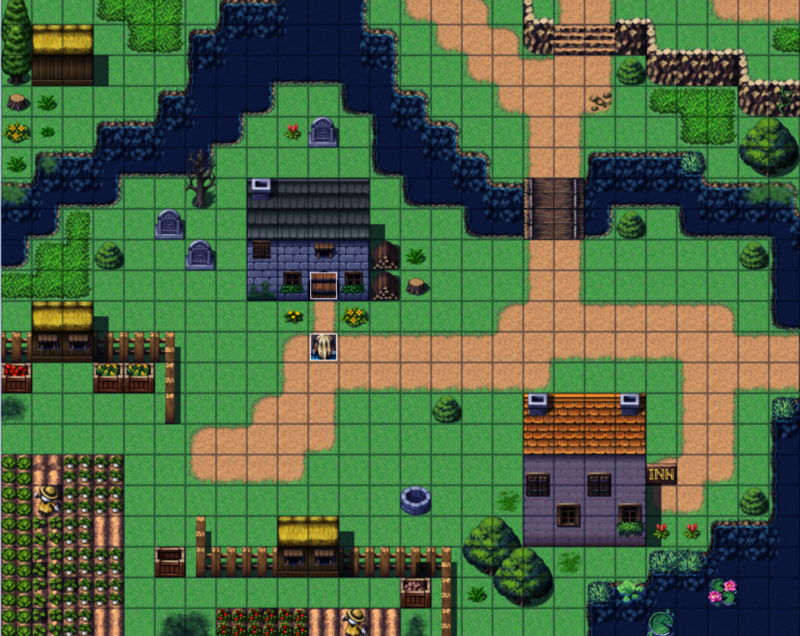 Liking your maps, so many RPG Maker games had square, inorganic feeling maps, but yours do a lot more to feel natural! 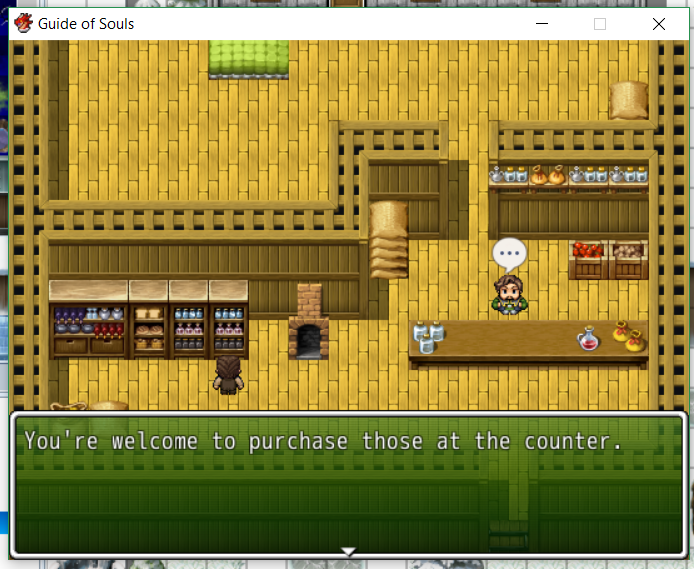 I'm a bit late to the party here, and it's been a long time since I used RPG Maker, but I remember there was a way to "tint" the game rather than have to recreate the whole map. I used to do an event with no picture in the corner of the map with Switch: IsNight ON, and then include the action that set the screen tint to a dark blue sort of colour. If Switch: isNight OFF then the tint is set to normal/none instead. I vaguely remember using this to simulate early morning (orange), day (none) and night (dark blue) based on Switches or possibly other variables. 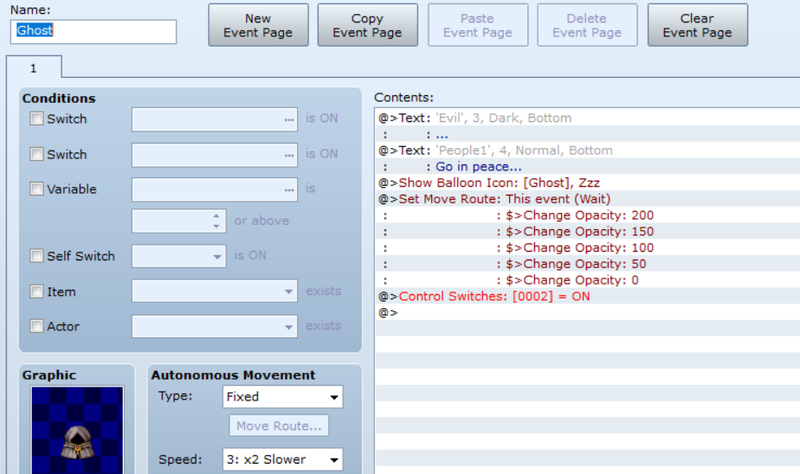 You can also use this switch in events so that they only are triggered during the day or night. 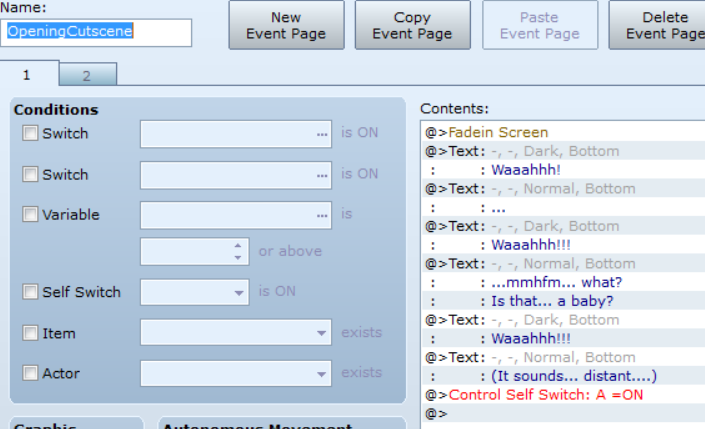 That way you don't have to create multiple tilesets and events! Day 1-15-18 - 4 days remain! Got a LOT of art done this weekend and it wasn't nearly enough but I'm still really proud of it. Character face art for three characters - left to right here are Ineni, Vaughn, and a generic ghost sprite. I've got two more done as well. 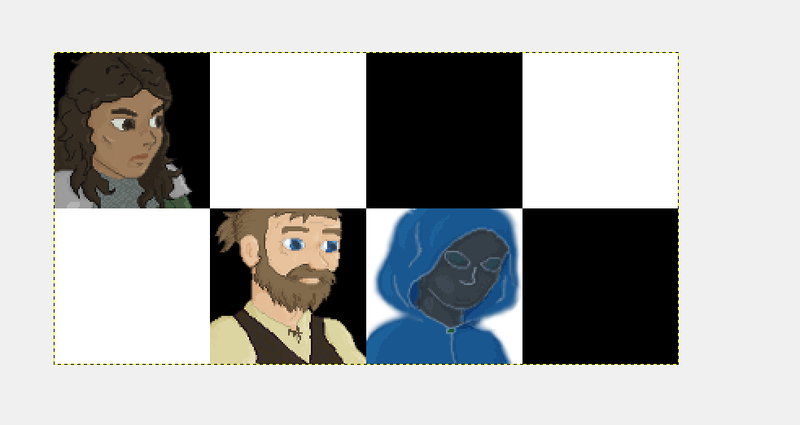 I wanted to have 8 done before I uploaded the art into the game, but I honestly can't think of three other characters I'll need art for, and I really need to get back to coding. For the sprites I'm basically just gonna be editing the pre-made game sprites, for now. I did some sprite coloring today, and tomorrow I'll start actually adjusting the pixels to change hair/clothes etc. 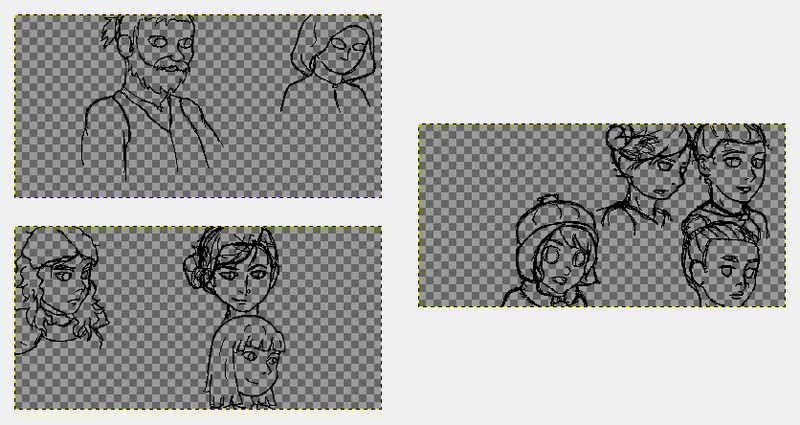 Since the face art is pretty much done, sprites will be my focus for the next couple days - I'll be using all the pre-made sprites for everyone except my main four characters, for now, so that I'm not putting too much on my plate. I have my temporary win condition set, so all I need to do for coding is write the scene that gives the quest to the player, and write the quest's end 'boss' battle. I also have several maps to make, but at this point the rest of the maps are just filler - interior scenes that I set up to exist, or places I knew I wanted ghost encounters to happen, or so forth. I've got four days, which should hopefully be less busy than this weekend was, so I should be able to get everything done in a reasonable timeframe. And if by tomorrow night I'm not significantly further along in sprite editing, I'll just abandon it to the last minute improvements column! Got some more coding done today! As well as a bit of sprite edits. Going on the theme of me being cheap, I took the pre-made sprites that came with the program and just spent several hours editing them to more like my character designs. There's a few more tweaks I'd make if I had the time to spend even more hours on these, but I'm really happy with how the changes came out even just for this primary two characters, so I'm gonna stop giving myself more work to do. These are Vaughn and Ineni, the characters the player will spend the most time with in this version of the game - I'm working on the sprite for Alasie, who will also be introduced in this version of the game but not for long. 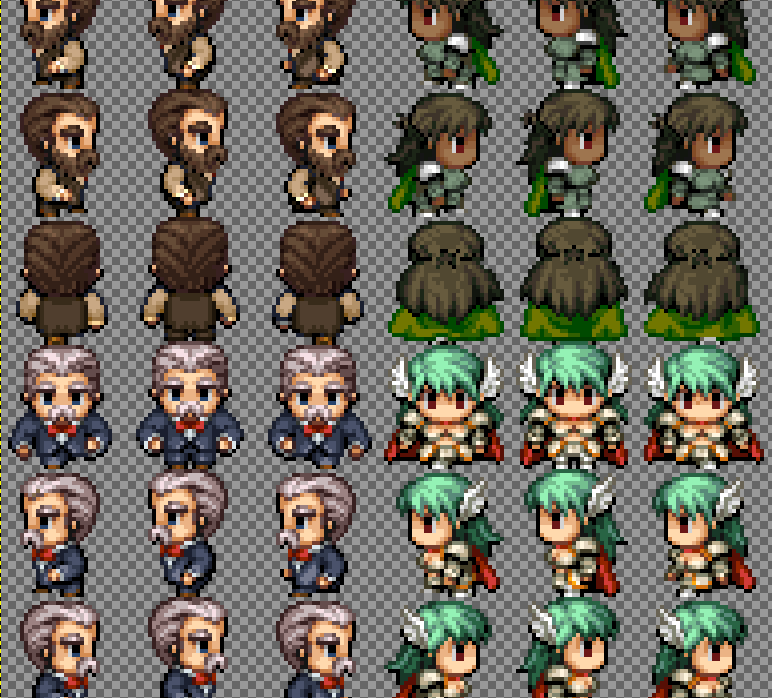 All the NPCs and ghosts will use generic sprites. I fixed a few bugs in earlier scenes and added in some flavor events while I had a free hour waiting for a friend, then coded the first half of the scene that introduces the character to the main quest. Yes, I know, this is way late in the game jam cycle to just be starting on the main quest, but a lot of the character design and worldbuilding work I did up until now will make working on the main quest super easy for me.... theoretically? I'm kind of stressing about this. Guess I know what I'm doing tomorrow. I had another picture but I guess it's not loading. Basically the main quest will be the essence of my original vision for this game; Vaughn finds a ghost sad and alone in the wilderness, and decides to help it by killing its murderer. The player will have to explore a bit to find the murderer, and there'll be NPCs around who give the player clues on where to go. I'm currently trying to decide between one 'invisible' event hiding on a corner of an overworld map that the player needs to step on, or just a deep room in a long dungeon. Either way, if the player finds the murderer too soon they'll have a harder time, since they won't have gotten as much time to level up. I took a bunch of screenshots to prove to myself that I accomplished stuff today! I actually did a lot today, working on this project was basically the only productive thing I did, but I'm still feeling way behind. Also, a preview of the 'Mountain' map - as you can see, there are hexagram portals that the characters will use to travel between each map (but there are also hints on how these sections of the world are connected in realspace as well - the bit of snow at the top of this map, for example, of the desert patch which was originally going to be its own area, but now won't, only partly because I discovered the free version of this program includes a map limit). 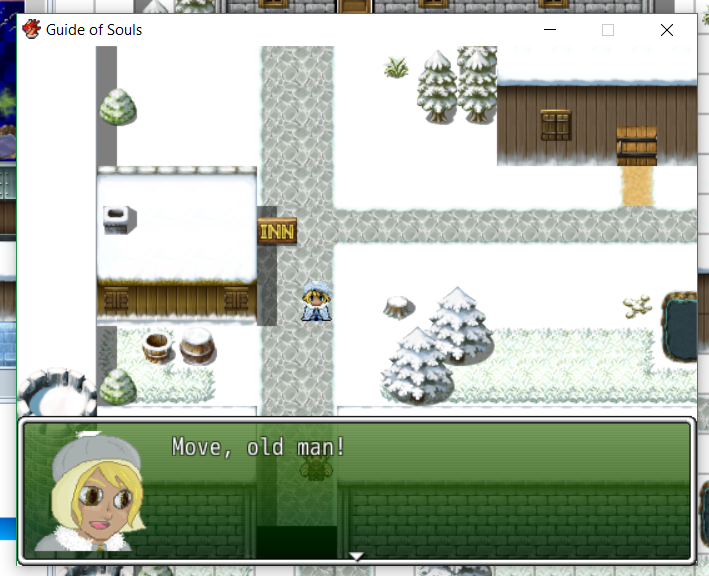 There's an inn in the main city on my snow map, where the player can heal up and talk to NPCs about the main quest. This NPC is appropriately labeled "Helpful One". I also finished editing the last character sprite I intend to include in this version of the game, but forgot to take a screenshot because I was too elated to be done, and now I'm too lazy to wait for GIMP to load up again. I've also done most of the setup for the boss battle, so I just need to write the scene introducing it and the victory credits afterwards, and everything I technically need for this game to be playable will have been achieved! I then got a big headache and had to take a two hour break with Horizon: Zero Dawn to unwind. Other things I did today: bought RPGMaker MV!! It's currently on sale on Humble Bundle, and now that I know I like this program there's no point in waiting for it to go on sale again. I won't be touching it until after this jam is over, but it's really nice to know I have it now? But that's beside the point. It looks like submissions are due by Sunday morning, which means I actually have until Saturday night to finish working, which means that if I get all the last bits of coding done tomorrow I can actually spend Saturday going over every line of code all over again just for quality check. I probably won't, but I could, which is nice to realize. I spent at least an hour today working on the in-game consumable items. Typing this I just realized the 'sell only' item I used for my screenshot example shouldn't be consumable, so I'll go fix that right now. I needed something for the new character I'm introducing to steal, so I had to have this system set up first. I was kind of ignoring it, in favor of having the player use the inn to heal up after battling, but this allowed me to waste a lot of time adding flavor events around the world for the player to find random items, so that was definitely a good use of time. And I finally added in Alasie! She's maybe my favorite character so while I could have skipped her for this version of the game... I didn't. She's a thief, and if you track her down she'll join the party and help you fight the main boss. Alternatively, you can completely ignore her, and only have two party members for the boss battle. I like the idea of giving the player that option - even though I intend the player choosing one option, being given that option is always a nice illusion of control. 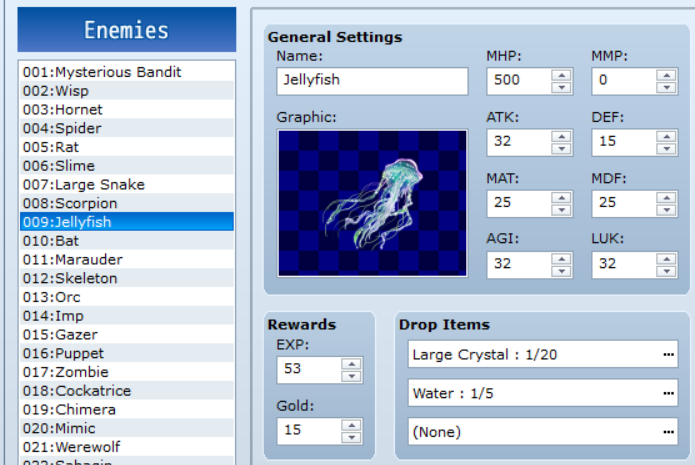 Did a little more work on enemies, primarily adding drop items (and lowering their rewards; the game's gonna be played in maybe twenty minutes or less, no reason to build up thousands in gold). I also reworked the troop combos a bit and changed their appearance rates, so the more difficult enemies appear closer to the portal for the next map, to indicate to the player that things will be getting more difficult from map to map. The last major update I made was to add a couple shops! Some of the enemies drop non-usable items that are just to sell, so I needed a few spots where they could be sold. So far they only have items - no weapons or armor. I need to work those items tomorrow, though I'll probably rely on the pre-designed weapons and armor that come with the program. The major task I need to accomplish tomorrow is designing the boss battle. The flavor of the battle itself needs to be programmed, as well as the scene introducing the battle, and the victory scene/credit roll afterwards. Once that's done then the game will technically be playable. I also need to do some beta testing. I've been beta testing scenes as I wrote them, and checking to make sure events process as planned and battles play out properly, but I haven't yet sat down start-to-finish tested the game as a whole. Once I finish designing the last battle scene, I'll test the whole game through to see if I need to make any changes to random encounters, or drop rates, or store prices, or any of those seemingly minor details that add up to an unenjoyable play experience. If I get extra time, I'll want to add in more flavor events, including more potential for dialogue between the main characters. For now, though, I'm going to try to get the project done by tomorrow night, then see what I feel in the mood for on Saturday. Thank you to everyone who followed along with my progress, gave advice and encouraged me along! Currently I have everything I technically need to have a playable game file! I'm extremely excited and more than a little exhausted. I still had some playtesting to do, but I'll be uploading my project tomorrow for downloading. I finished coding the boss battle and final cutscene today. I spent an hour trying to figure out how to get an event to save your game and return the player to the title screen without looping indefinitely, before giving up on that lost cause. I considered including some post-game easter eggs, but decided no one's really going to stick around that long. After tomorrow, I'm going to take a short break from coding to try to sleep, then I plan to slowly recreate this project in RPGMaker MV. I'll be blogging the process on my game blog, GamingOfKenna.tumblr.com, in case anyone wants to see my updates there. I definitely want to work towards my original project vision, and with the skills I learned during the game jam I'm pretty sure I can. Wow! This is really impressive work, especially for just 2 weeks. You got a *ton* of stuff done in that time! I got a good chuckle when my party member wouldn't let me go in one direction, because they had to inform me there were limits on the free version of RPGMaker :) I see you picked up a full version. I hope you keep up with development! You have a knack for it. Great job!